Was your weekend pleasingly full or pleasurably empty? We measure our happiness not in moments of activity but rather memories of satisfaction. 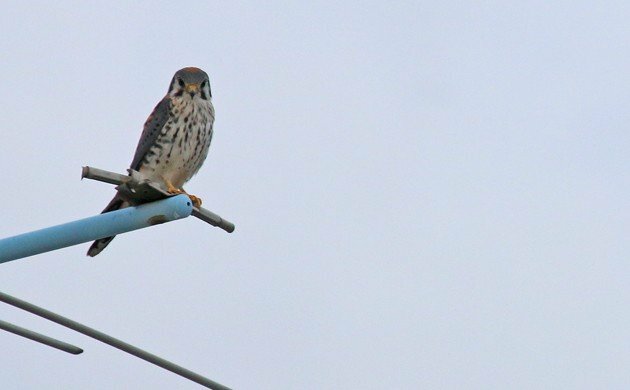 I was well satisfied to travel through farm country this weekend and count the many American Kestrels perched predatorily above the fields. Corey’s Best Bird of the Weekend was a Bushy-crested Jay, one of quote a few fine species he spotted while exploring the area around Copan Ruinas in Honduras. Streaked Xenops for me while birding Tapanti National Park in Costa Rica. Got my 600th species for the year as well! Western Bluebirds – Three recent fledglings came with their parents to the meal worm feeding station in eastern California. Tufted Puffins! I was lucky to help out on the Port Townsend Marine Science Center’s “Puffin Cruise” around Protection Island, where we saw three magnificent puffins, as well as 30 Bald Eagles and many Rhinoceros Auklets and Pigeon Guillemots.